Bulgaria marks over the weekend the 156 anniversary since the birth of one of the country’s most important political figures, Stefan Stambolov. 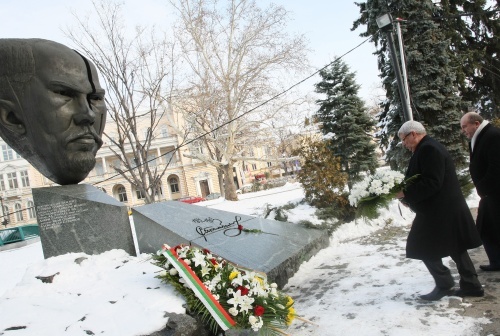 Wreaths were laid at Stambolov’s monuments in his native city of Veliko Tarnovo and in the capital Sofia. Bulgaria’s new Defense Minister, Anyu Angelov, the Director of the History Institute at the Bulgarian Academy of Sciences, Prof. Georgi Markov, other scholars and many citizens attended Saturday the ceremony in Sofia. Bulgarian politician Stefan Stambolov is considered one of the most important statesmen in the country’s history, and one of the "Founders of Modern Bulgaria" often referred to as "the Bulgarian Bismarck". Stambolov was born on January 31, 1854 in Veliko Turnovo. His education began there, but in 1870 he left for Odessa to study at the Odessa Seminary. He was expelled in 1872 for ties with Russian revolutionaries. Stambolov's father took part in the plotting of an uprising against the Ottoman rule, known as "Velchova Zavera" (1835), so he grew up among revolutionaries like Hristo Ivanov "Knigovezetza", father Mathei Preobrazhenski - Mitkaloto, Hristo Karaminkov "Buneto". Stambolov took part in all activities aimed at political independence in the 1870s such as joining the Bulgarian Revolutionary Central Committee (BRCC). After the death of the founder of the BRCC Vassil Levski, Stambolov was chosen as his successor. He was the leader of the unsuccessful uprising in Stara Zagora (1875) and the Turnovo revolutionary committee in the Great Uprising of April (1876). In 1875, together with one of Bulgaria’s greatest poets, Hristo Botev, Stambolov published the poetry book known as “Songs and Poems.” He married Piloxena Stancheva in 1888 and they had four children. Stambolov was a prime figure during the political discussions between Liberals and Conservatives at the time of the first Bulgarian parliament - "The Founding Great Assembly" in 1879. In 1880 he became the Deputy Speaker and later Speaker of the Bulgarian Parliament. From 1887 until 1894, Stambolov was Prime Minister of Bulgaria and by supporting the “Plovdiv Coup” he helped the 1885 Union of the Principality of Bulgaria and Eastern Rumelia. In 1886, when pro-Russian officers staged a coup d'état against Prince Alexander Battenberg, Stambolov firmly opposed the move and was instrumental in ousting its organizers. Battenberg, however, could not remain on the throne without the approval of the Russian Emperor and had to leave the country. Stambolov was known for his anti-Russian leaning and counteracted Russia's numerous attempts to overthrow the Bulgarian government. He confronted Battenberg’s successor Ferdinand Prince Saxe-Coburg Gotha, who wanted to secure his power by Russia’s diplomatic support. Stefan Stambolov was Chief Regent for the Bulgarian throne twice - during the self-imposed exile of Battenberg between August 28, 1886 and September 3, 1886, and during the vacancy of the throne between September 7, 1886 and August 14, 1887 following Battenberg’s abdication. Stambolov's style of governing during the period of his regency was observed as being increasingly authoritative while his efforts to preserve Bulgaria's independence against Russian influence earned him many political enemies such a Russophiles and Ferdinand himself, who saw the PM as an obstacle to his power. As a result, Stambolov was put under a tremendous amount of stress, which led to his becoming overly suspicious of his surroundings and distant from his allies, and to his resignation as PM in 1894. In July 1895, Stambolov’s carriage, where he traveled along with his bodyguard and a friend, was stopped by three Macedonians, hired to kill the politician as revenge for the death of Kosta Panitsa – a former friend and follower of Stambolov, who, reportedly on directions from Russia, attempted unsuccessfully to assassinate Ferdinand and was later executed. Stambolov was savagely attacked with a gun and knifes and suffered many cuts on the head and hands and a fractured skull. He died at his home during that same night. Stambolov’s rule and politics are marked by intense lawmaking and work to secure Bulgaria’s economic independence and to overcome Bulgaria’s delayed development in many sectors. Stambolov is credited as the father of the State’s protectionism of Bulgaria’s economy. During his cabinet term, he lays the foundations of the processes that turn Bulgaria in the most dynamically developing Balkan country.